Only luxury homes usually have a bidet. This one is in a $115,000 fix-up home with only one bath, total. 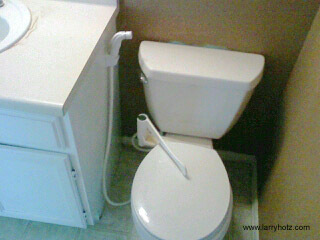 Occasionally, I will find a luxury home in one of our lofty suburbs that has a bidet in the master bath. It’s usually considered an extravagance. But, one of my Kentwood Colleagues recently showed showed a fixer-upper home with a “starter bidet”. I couldn’t believe it when Al shared this photo by inter-office email. His client took it on a cell-hone and emailed it to Al. Someone has obviously hooked-up a sink sprayer like the ones used to wash vegetables to a regular toilet. It appeared to be a “do-it-yourself” special. This is the typical bidet arrangement. Bidets are usually used to wash following use of the toilet. But, they are usually fojnd in luxury homes and only in the master-bath. It is usually a separate fixture like this one. Bidets date back to about 1700 in France. They are more common there and in Europe than in the United State. In Denver, bidets are very rare in bathrooms especially in more modest homes. Still, some luxury homes will have a separate bidet facility in the master bedroom bath. Great story. You just never know what you are going to find! It’s funny. Some time ago I saw a portable bidet on small wheels to save room. It had flexible hoses. I think this type would rank between typical bidet and this “starter” above.